Talaso Hoko (30) holds her two-year old daughter, Bokayo, outside their home in Marsabit County, Kenya. March 9, 2017. Photo by Jake Lyell for the ChildFund Alliance. Many parts of Africa, particularly countries on the east of the continent, have been suffering from the effects of prolonged drought caused by the El Nino weather system. Scientists believe the weather system, so important to the lives of millions of people in the developing world, has been significantly impacted and disrupted by climate change. The consequence of these changes can be enormous and profound for people who live off subsistence farming to feed their families and provide them with small incomes. People in the developing world rely on rainfall happening at those times of the year when it is supposed to happen. Without sufficient rain, crops can wither and die, vital harvest’s are lost and from this dynamic a food crisis can be born. Although some African countries, notably Ethiopia, have adopted systems to help protect their citizens from food crises, the problem can quickly become vast and overwhelming with millions of people exposed to risk. That is the stark reality currently afflicting millions of Africans. Kenya is one such country that has been badly impacted by drought In February the government declared a national drought emergency. it is estimated that some 2.7 million people are exposed to risk with some 350,000 children and lactating mothers already, acutely malnourished. Talaso (30) is a mother from Kenya wresting with these worries. 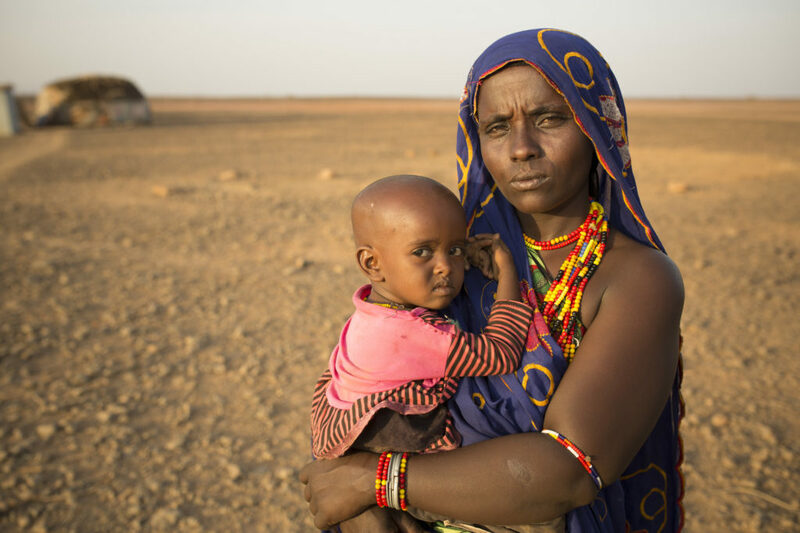 In the picture above she holds her 2-year-old daughter Bokayo outside their family home in drought-stricken Marsabit County. Unfortunately Bokayo is one of many children suffering from the effects of malnutrition because there is simply not enough food to go around. Livestock animals have migrated from the area or have perished in the drought. As a result, families have lost their source of milk and income, as well as the crops that have been damaged by the drought. We will continue to monitor this hugely important issue and post updates as they arise.